Where traditional lead generation techniques to find wholesale and off-market real estate deals require you to go out and pound the pavement: drive the streets, post bandit signs, knock on doors, to name a few; the internet has opened up a whole new set of options to finding real estate buyers and sellers anywhere in the world, from anywhere in the world. As of the writing of this post, Facebook ads are currently the most talked about outbound marketing channel online. Facebook ads can be set up to drive traffic and visitors to your website, or you can use Facebook’s Lead Generation ad type to have people submit their contact information without ever leaving Facebook. Tired of being a landlord, but still want the income? Sell us your home with owner financing to keep the income, get rid of your tenants, and start living the life you have always wanted! When you create a campaign, you can set the ad objective — what you want to gain from the ad such as traffic, lead generation, and so on, the ad targeting — the who and where — people living in certain zip codes or a specific city, with these specific interests, etc., the dates that the ad will run, and how much you want to pay for your ads. There are 4 major search engines that support paid as well as organic search results: 3 of them text based, and the other one being Youtube. When a distressed homeowner or tired landlord is looking to solve a specific problem, the first thing that they will do is look for information on how to accomplish that on Google, Bing, or Yahoo. With Search Engine Marketing, you can purchase certain keywords and phrases so that your lead capture web site that solves that problem will come up first in the search results whenever someone searches for your keyword combination. Unlike Facebook marketing where you are interrupting a user scrolling through their feed, search engine marketing is a little bit higher intent, in the sense that people are looking for a solution to a particular problem, and you are presenting them with a potential solution. If you don’t have a budget to spend on advertising, but still want to end up as a search result to solve a particular problem and drive leads, then you have to build content around those topics that the search engines will deem as a solution to that search query. While it takes about 3-6 months for your content to rank as a search result on the first page, as you climb the search rankings your content should eventually drive qualified free traffic to your web site. When they do get to your site, offer them something of value such as a pdf guide on how to solve the problem that they’re interested in. This is called a Lead Magnet, which you can use to offer in exchange for their email address or other contact information. Youtube is the world’s second largest search engine, next to Google, and it’s used by people who are looking to solve a particular problem in a visual way. You can create step-by-step actionable videos to provide them the solution that they’re looking for. Getting your “We Buy Houses” message out there doesn’t require anything more than your camera phone or webcam and microphone to record the spot. With Youtube, similar to the Google search engine, you can either get your message in front of people by advertising to a particular target audience, or play the long SEO game and establish a strong channel presence that makes you an authority on a subject, such as how to get rid of their home quickly. If you are selling a property online, then set up an alert for that property address. You can see when it’s being shared, tweeted, or when someone leaves a comment about it. You can also set up alerts to let you know what your competitors are up to, such as real estate agents or brokerages. Post “We Buy Houses” ads on Craigslist.org, Oodle.com and any other local advertising channels you can find. With these ads, you can find both buyers and sellers. Potential buyers will call your ad to shop around for the best offer on their property; and cash buyers and other real-estate wholesalers will call the ad to inquire about your inventory. 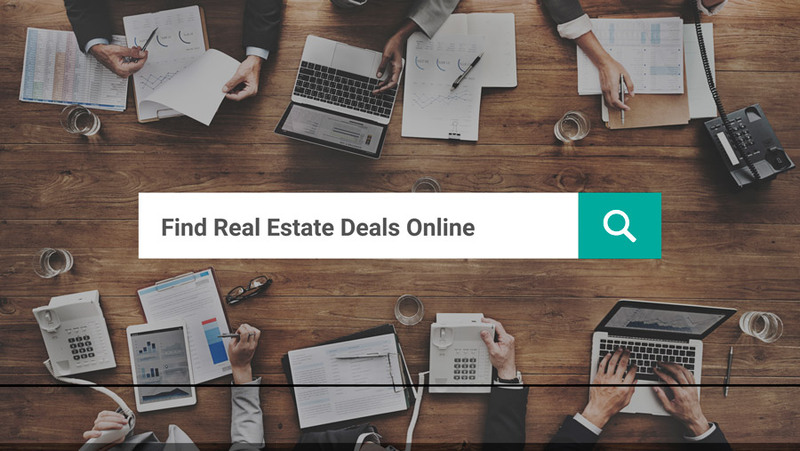 Search Facebook and Google Plus for real estate wholesaling, flipping, and buy and hold groups where you’ll find real estate wholesalers and other members who have deals to pass along. Make sure to offer your email address and follow up with buying criteria. If you are investing locally, another good source is NextDoor.com, where locals share information on their own and nearby communities. Redfin has a leg up on most other public real estate portals such as Zillow. It’s a brokerage, so the data you find is imported straight from a local MLS, updated every 15 minutes, the same way a realtor would have access to the listing information. You can use Redfin to find distressed real estate easily. Once you search a zip code, you can use the ‘More Filters’ toggle to specify house features and price, or even drill down for the specific terms you’re looking for in the Keywords box. To make it even easier, you can search for Active and Sold listings and if you select the ‘Show More’ link within the ‘Listing Status’ area, you can select the ‘Fixer-Uppers Only’ or ‘Priced Reduced’ box. It also has boxes to include ‘Foreclosure’ listings and ‘For Sale By Owner’ listings. The only caveat is that while Redfin has good coverage of the United States up to this point, there are still areas it does not cover. So for MLS access where Redfin is not available yet, you’ll still need the services of a realtor. Realtor.com has a more limited search functionality, however it does allow for radius searches by distance, has an expanded ‘Community Amenities’ section, and also a ‘Price Reduced’ selection. Sellers who have been forced to reduce their prices or a buyer fell through on their last contract might be someone who is running out of time. You can enter the keywords “back on market” in Redfin’s keyword search to find these properties. Similar to price reduced, after a buyer falls through, a seller might be more willing to accept a lower offer because of time constraints, or other motivations. You can use the Time on Redfin filter to find these properties. Again, similar to price reduced, and back on market, a seller might be more willing to accept a lower offer with the property just sitting there with potential buyer interest having long waned. Redfin also has a convenient fixer upper flag to filter properties only for fixer upper keywords. Another Redfin filter to show you all the foreclosures in an area. These websites allow wholesalers and those specializing in real estate investments to post their deals. MyHouseDeals.com is one of these. Other sites, such as education site Biggerpockets.com and ConnectedInvestors.com also have advertising sections where deals are frequently posted. HUD (Federal Housing and Urban Development) homes are those where the borrower on a house used a government funded FHA loan to purchase the property and then defaulted on the loan. Look for Uninsured properties (as opposed to Insured properties that owner-occupants will live in). All properties go through a stage where owner occupants get “First Look.” If, after a number of days, the property is still available, it is opened up to non-owner occupants. These homes have a similar background as the HUD homes, and a similar rule where owner occupants get the first look at the property, and then investors can jump in. One note to keep in mind about Fannie Mae homes is that there are deed restrictions where, if you are flipping the property, you cannot sell the property for any sales price within 30 days, and after that, cannot sell for more than 120% of what you purchased it for 90 days from the date of the deed. This may change in the future, so be sure to look at the rules periodically. Many Section 8 government programs are available online. There may or may not be free lists available, but there are often postings of available units and you can contact the owner about selling their property. Real Estate Owned (REO) Bank-Owned Properties are those that the bank foreclosed on and are now selling to recoup their losses. Each bank has their own listing criteria and may have a list of properties available. If you want to do a wide-scale direct mail campaign to blanket your target area, or narrow it down and send to just specific types of sellers, you can purchase lists of property owners online for pennies per lead. People who own real estate but do not live in the property. Absentee owners can also be named a Trust, LLC, or Corporation. No need to be intimidated by a company as owner — behind the business is a real face who may need the solutions you offer. These could be people who inherited property or are renting or leasing the property out and managing from far away. Multiple property owners often want to sell their entire portfolio in one sale. Multi-family properties come with their own set of challenges, and their owners may be ready to move onto different kinds of investments. When property owners have not paid their mortgage for 30, 60, and 90 days they are typically issued a pre-NOD by their lender. In most cases if no payment is made, the lender then files a Notice of Default. This public Notice is filed in court or at a county Recorder’s office. That action begins the clock for the homeowner letting them know that their property will be sold. If there is no resolution during the foreclosure timeline, then the lender may foreclose on the property at auction, often called a Trustee’s sale, an event that will take place within 90 days or up to a year, depending on the state. At each step of this process, a distressed homeowner will experience different levels of motivation to liquidate the property. When a property owner owes the bank more than what their house is worth, they are considered to be “underwater” or “upside-down” on their mortgage. If the owner cannot make payments and decides to sell to cut their losses, they make a request to the lender to short sale the property. The term “short” refers to the fact that the bank will agree on a price that is “short” of what the home’s value is. Short sales can take months, and final approval from the bank on the sale is required, but if you have the patience there are some gems to be found. For your perspective in negotiating with distressed sellers, it’s important to note that foreclosures and short sales fall on the same timeline, however, a lender forcing foreclosure has far more devastating consequences to the seller’s credit scores than a short sale impacting the seller’s level of motivation. Probate deals are those involving property where the owner passed away and their real property is being sold or auctioned to satisfy debts of the estate, or to liquidate for heirs. This process is often done through Probate Court, so while these deals take a long time, they are well worth it if you know how to navigate the system. Approach a delinquent owner before the taxed property has gone to auction. The best time to approach an owner depends on what the time schedule is for the payment of taxes. An owner who just received a notice is far less motivated than an owner who has been in default for two years and faces hundreds in fines on top of the tax amount due and is looking for a way out. Tip: When selecting these lists, some criteria are better than others. If targeting Single Family Residences, for example, choose owners with high equity or with free and clear properties. The longer the owner has owned the residence, the more equity they are likely to have in the property or the more likely they are to own it outright. Now that you have your list of distressed sellers, you might wonder how you should reach out to them. Yellow colored, lined paper with a message in a red, hand-drawn font meant to catch the attention of the seller. Hi, my name is [Your Name]. I am interested in buying your house at [Property Address] for cash. Please call me at [Number]. The text can be as simple as the example above, or specifically geared towards a certain segment of the population, such as probates, bankruptcies, attorney referrals, and so on. Yellowletters.com, yellowletterhq.com, and yellowletterscomplete.com supplies pre-printed letters you can purchase and distribute, or you can go the hand-written, hand-stamped route and try MailLift.com. Having the World Wide Web available 24/7 means that you can find off-market and wholesale real estate deals from anywhere, even in your pajamas. You now have over 50 ways to generate property leads that you can get started on, today.